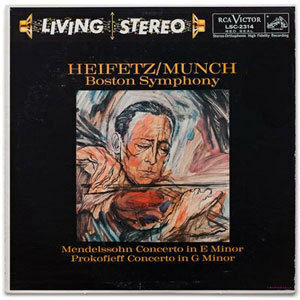 This 1958 3-track recording has Heifetz teamed up with Munch and the Boston Symphony. Cutting the lacquer directly from the original session master tapes has increased the transparency and 3-dimensional imaging on this reissue over original pressings. The performance, as always with the last century's top violinist, is almost without compare. If you have an original copy (white or shaded) you'll be shocked — this reissue has diaphanously beautiful string tone, superior low end dynamics and very deep bass.